Declaration of the Rights of Man and of the Citizen. It uses the style of the Ten Commandments. "First Article – Men are born and remain free and equal in rights. Social distinctions can be founded only on the common utility." 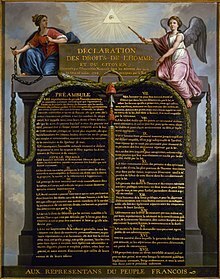 The ideas written in the declaration are important in French law today. They can be used to fight or change new laws or other government actions. French law is based off of this document. ↑ Some sources say 27 August because the debate was not closed. This page was last changed on 4 March 2019, at 19:45.